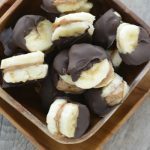 I’m always looking for healthy snacks for my kids, and these frozen banana bites hit the spot! About a year ago, we did an elimination diet and we were off of gluten, dairy, soy, peanuts and sugar. I know! Thankfully it was not long term, because it was hard work! My heart goes out to all of you mamas who are off of these foods long term. You really have to get creative. Eliminating certain foods from our diet was so good for me as a cook. We tried new things, we ate better and my confidence in the kitchen grew. One of the things I fell in love with was these Good Life Chocolate chips. They are gluten free, dairy free and soy free. I love to keep them in my pantry all the time now, along with almond butter. Next time you need a little snack, you’ll have to try these frozen chocolate almond butter banana bites. They are super easy to make and so tasty. 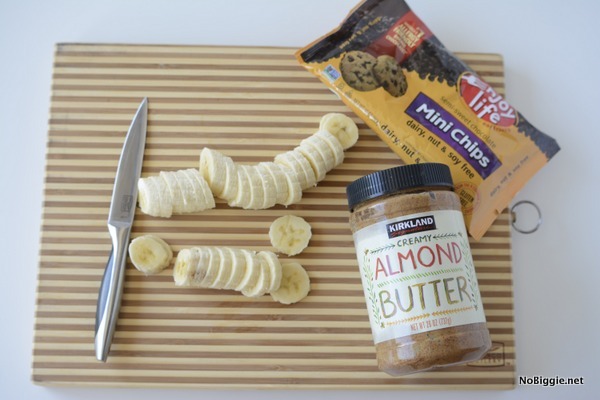 Here’s the easy How-To: Just slice up a few bananas and spread a little almond butter on half of the small banana slices. Sandwich the slices with another small banana slice in similar size. Flash freeze the little banana bites for 15 to 20 minutes. 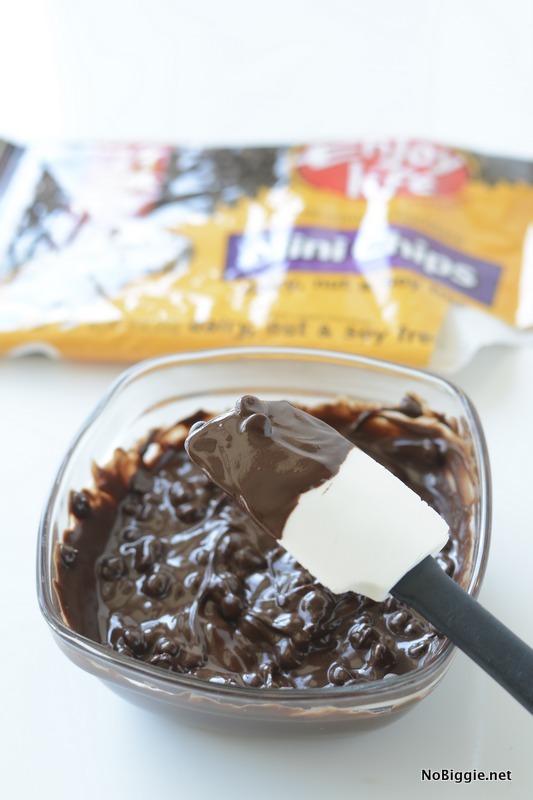 While the banana bites are in the freezer, melt the Good Life chocolate chips in the microwave in a glass bowl for a minute or two. Now you are ready to dip. 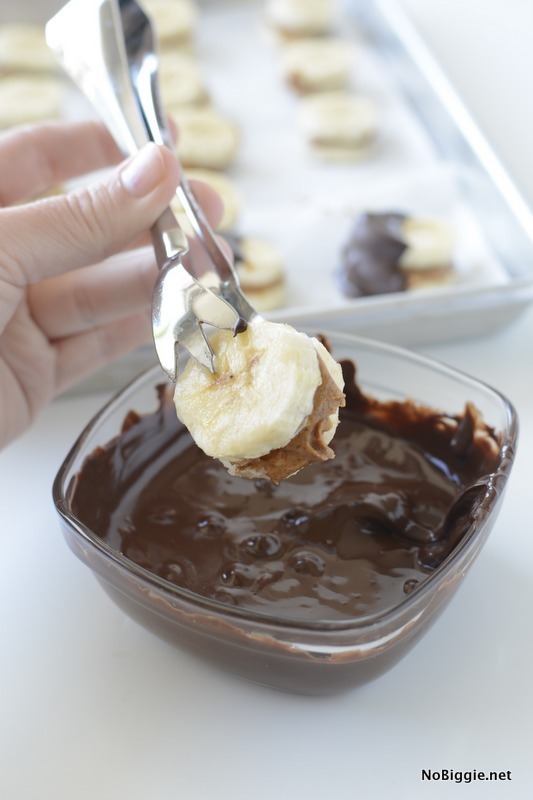 Using a small pair of tongs, dip each little banana bite into the warm melted chocolate. The tongs help to grip the bananas, as they tend to be slippery. 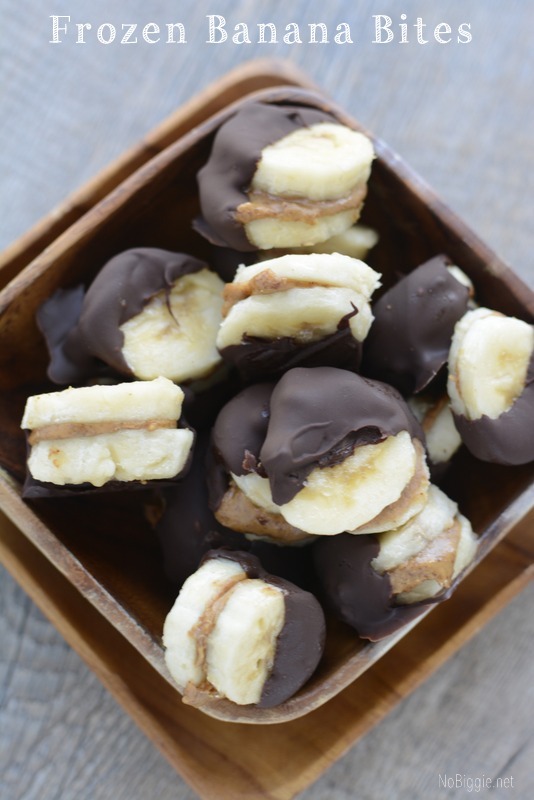 On a half pan on top of a parchment sheet, freeze the banana bites for 30 minutes or until the chocolate has solidified. Slice up a few bananas. 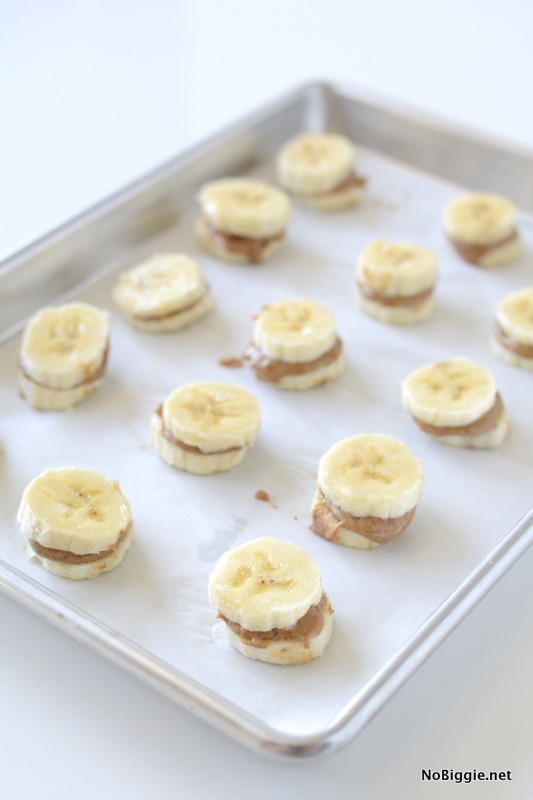 Spread a little almond butter on half of the small banana slices. Sandwich the slices with another small banana slice on top in similar size. Flash freeze the little banana bites for 15 to 20 minutes. While the banana bites are in the freezer, melt the Good Life chocolate chips in the microwave in a glass bowl for a minute or two, stir the chocolate until smooth. 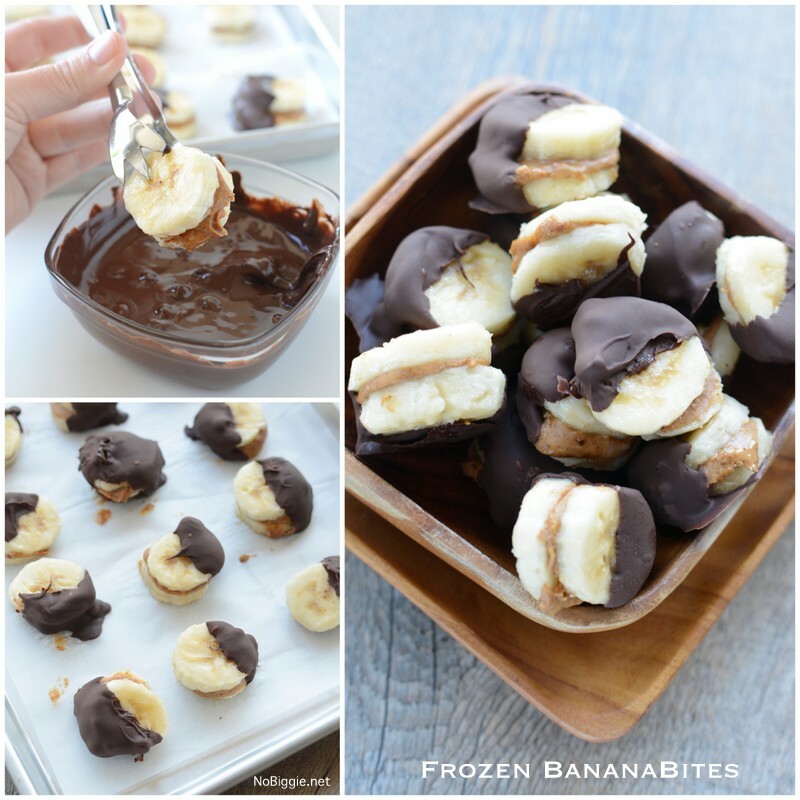 Freeze the banana bites for 30 minutes or until the chocolate has solidified. Once frozen move to a plastic air tight container and keep in the freezer. That’s it! Now you are ready to enjoy! You’ll have to try these! They are so good! If you’re looking for more gluten free and dairy free snack ideas, you’ll like this post of 25+ Gluten Free and Dairy Free Snack Ideas. What a simple and easy snack! I am always on the hunt for healthy snacks too! This is perfect and has the sweetness I am looking for in a snack! Thanks for sharing! Hi Amalia! The recipe now has a printable version. Thanks for letting us know. Sorry for the inconvenience! How many servings for the recipe? These sound great! Do you know the nutritional breakdown? Ex: Cal, fat, etc? Thank you. How do you keep the bananas from browning? Mine instantly brown as soon as I stick them in the freezer and do not look remotely appetizing. Hi Becki! Try freezing the banana whole and then slicing.